Built in 1910 by Sr. Commander Harrison from the English Royal Navy for his wife Lady Caroline Wedgwood, daughter of British china magnate Josiah Wedgwood, the Manor is an intriguing English Country House transplanted to a setting of amazing natural beauty, where white-tailed deer browse in the fields and bald eagles and osprey soar in the sky. A short drive to the perfect “fun” getaway. The Manor's suites have been set up to invigorate and inspire quiet relaxation. The suites are absent of common electronic devices such as televisions or radios for optimal relaxation. Each suite has a private en-suite bathroom and a lounge or sitting area. Four spacious suites are located on the second floor and open onto the quiet, comfortable library, All have large windows with views of Kokanee glacier, the front gardens or the back forest and original outbuildings.. One of the suites, The Study, is located on the first floor and overlooks the gardens and mountains. The Manor is a slippers-only facility as the floors are over 100 years old. Comfy slippers are suggested to be included in your luggage. Check our General Info page for policy details. 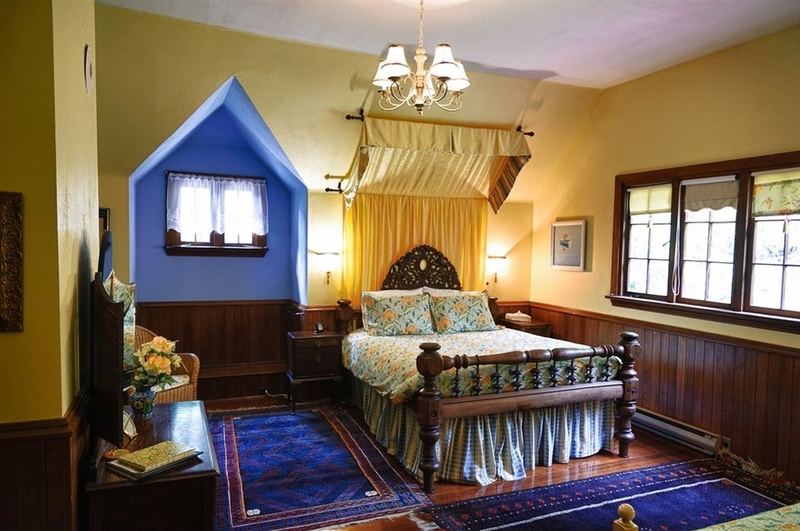 The Charles Darwin Suite, named for the uncle of the original owner of the Manor, features a handcrafted four-poster queen bed of rough-hewn birch, a single bed and a stunning view of Kokanee Glacier. Its private bath has a hand-built shower with a stone floor. The Lady Caroline Suite, is a magnificent suite with an antique queen bed from India and reading sofa, is a cheerful yellow room that captures the morning sun. The room has a lovely view into the forest. Enjoy a long soak in the private bath's claw-foot tub, or a quick shower. With a splendid view of the grounds, the Commander's Suite is decorated in soothing robin’s egg blue and butterflies from faraway lands. The high queen bed and daybed are amazingly comfortable. The cedar-paneled private bath has a spacious corner shower. The Study Suite is our only first floor suite. With the elegance and class of English Country, this suite boasts darker wall paper, a gorgeous private deck overlooking the mountains and a direct walkout to the gardens. Your “fun” vacation getaway is waiting.